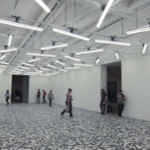 Rafael Lozano-Hemmer - Project "Homographies"
Homographies is a large-scale interactive installation featuring a turbulent light array that responds to the movement of the public. 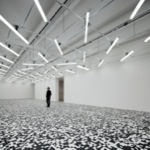 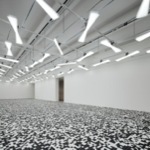 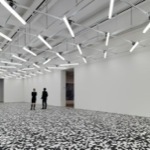 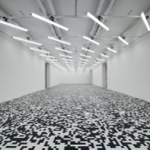 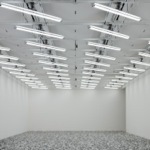 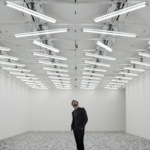 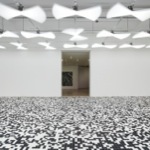 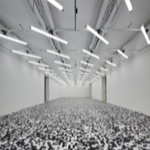 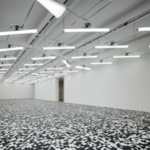 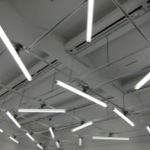 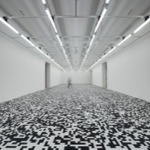 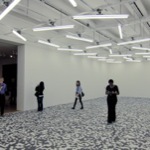 The installation consists of 144 white fluorescent light tubes which are hung from 72 robotic fixtures on the ceiling of the exhibition space, equally spaced. 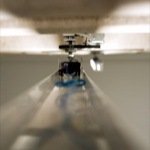 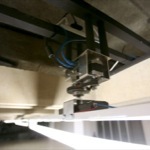 Each light tube measures 1.83 m long and is rotated using a computer-controlled stepper motor. 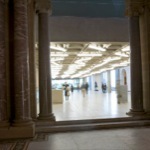 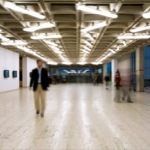 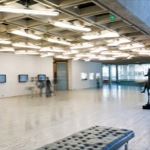 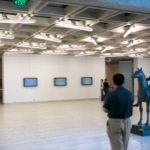 All lights are always on and typically constitute the only lighting in the exhibition hall, except for the natural light that spills into the space. 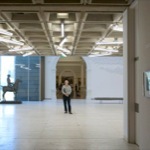 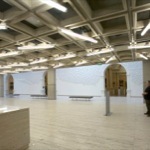 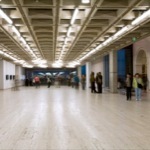 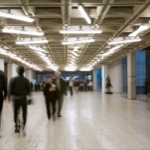 Originally developed for the Entrance Court of the Art Gallery of New South Wales (AGNSW) and exhibited at the Sydney Biennale 2006, the piece can cover an area of between 240 and 420 square metres. 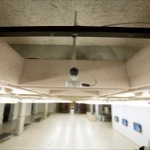 The piece uses a surveillance tracking system with six tiny panoptic cameras placed on the ceiling; these detect the presence and position of people in the exhibition space. 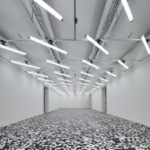 As they walk through, the system automatically rotates the light tubes very slowly to create labyrinthine patterns of light that are "paths" or "corridors" between people. 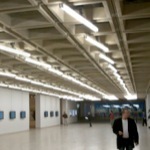 In Homographies the "vanishing point" is not architectural, but rather connective, i.e. 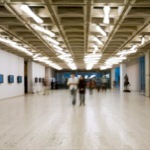 it is determined by who is there at any given time and varies accordingly. 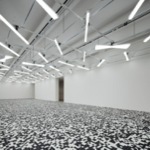 This gives a reconfigurable light-space that is based on flow, on motion, on lines of sight, an intended contrast to the cartesian grids that organize most modern architecture. 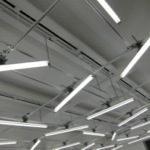 The fluorescent light tube is found in just about any default architectural space: offices, schools, hospitals, museums, prisons, factories. 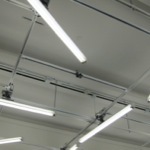 The ubiquitous presence of these strip lights refer us to our cold experience of architectural normalization (i.e. 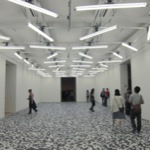 homogenization, globalization). 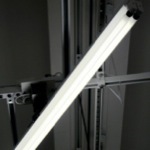 Very often, especially when found in corridors, fluorescents line-up and index a direction. 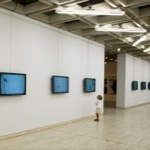 Homographies attempts to pervert that linearity and "privileged point of view" and instead offer a plurality of points of contact. 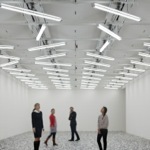 Keywords: generator, robotic, tracker, indoor, interactive, lights. 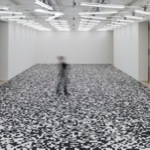 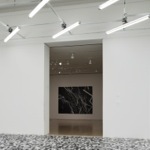 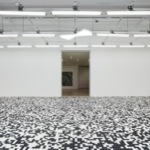 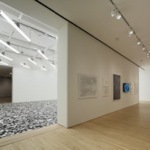 Field Conditions, San Francisco Museum of Modern Art, San Francisco, California, United States, 2012 - 2013. 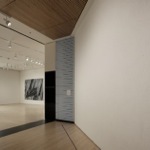 Sculpture as time, Art Gallery of Ontario, Toronto, Ontario, Canada, 2010. 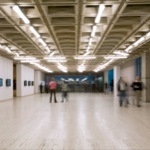 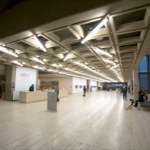 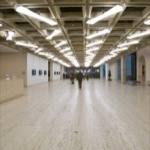 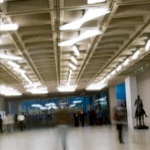 Floating Artworks, TD Centre, Art Gallery of Ontario, Toronto, Ontario, Canada, 2007. 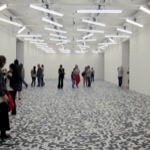 Art Basel Unlimited - Art Basel 38, Galería OMR, Galerie Guy Bärtschi and bitforms gallery, Basel, Switzerland, 2007. 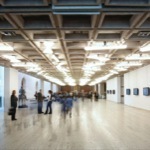 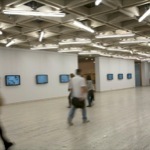 Zones of Contact, Biennale of Sydney, Art Gallery of New South Wales, Sydney, Australia, 2006. 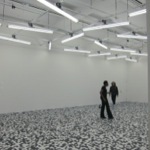 With the assistance of Conroy Badger, Matt Biederman, Sandra Badger, Natalie Bouchard and Will Bauer.